Last week the Constituent Assembly officially released the agreed upon preamble to the new constitution. Here are a few brief takeaways from its release. 1) It’s just a preamble. Constitutional preambles set the tone and background for a constitution, but they are rarely in and of themselves law. The preamble to the U.S. constitution is one sentence (54 words)(1). The French constitution is 100 words and two sentences(2). Even the UN, not known for its brevity, has a charter in bullet points of only 236 words. The Tunisian preamble, on the other hand, runs 433 words (in English) and 8 paragraphs. It includes references to Tunisian history, Arab history, Muslim culture, the Palestinians, and the environment. The fact that the preamble took six months to draft, and the fact that it is a kitchen sink of ideas does not necessarily bode well for the timeline set out by the Constituent Assembly speaker Mustapha Ben Jafaar, who has promised that the document will be complete by October 2012. Additionally, Constituent members took the not so humble step of honoring themselves in the first line. “We, the deputies of the Tunisian People, members of the National Constituent Assembly, elected through the merits of the Revolution of dignity, freedom, and justice”. It’s noteworthy in comparison to other constitutions, such as the U.S. and French, which make pains to show that the constitution itself emanates not from their leaders, but from the people themselves (“We the people”). 2) This is clearly a document of compromise. The length and wordiness of the document is no doubt a result of compromise positions within the Constituent Assembly. More conservative members were no doubt pacified by the document’s reference to the country being founded on the “fundamentals of Islam” – something that liberal Tunisians see as a back door to introducing Sharia law. Meanwhile more liberal members will be happy with references to an “open and moderate” Islam based on its reformist movement. The latter is a reference to Tunisian intellectual theologians who in the early part of the 20th century helped provide a path toward a civil state through a more modern interpretation of Islamic theology. Contrast this with previous versions of the document that were released through members of the constituent assembly, which provided a much more bold references to Islam and the country’s Islamic identity. 3) The document is careful to avoid references to universal values or rights. While the document does endorse human and equal rights among Tunisians, it does not take the bold step of endorsing universal rights, such as the UN’s Universal Declaration of Human Rights. Many Muslim countries have refused to sign on to this document as some consider it to subjugate Islamic sharia to man-made rights. 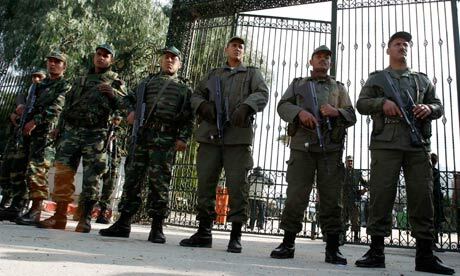 Liberals in Tunisia had hoped that the assembly would have taken this bold step which would have set precedents for the country’s judges to use as a basis for adjudicating rights claims. The document as is remains so vague that the constitution itself or the country’s civil code will have to set out exactly what rights will be considered fundamental. 4) The question of Palestine makes a not-so-subtle, and somewhat problematic, appearance. The document states that “individuals have the right to self determination, and for movements of justified liberation, at the forefront of which is the liberation of Palestine.” It’s a curious construction, obviously based first and foremost by the motivation to include the populist sentiment to support the Palestinian cause. What’s interesting is the reference to self-determination, which is the legal basis for Palestinian statehood, in the absence of warfare. However, self-determination is also the basis for independence movements across the world, notably among Western Saharans in their dispute with the Moroccan government and in Berbers in Kabylie in Algeria. It will be interesting to see whether this clause will cause diplomatic problems for the government at the same time that it is looking to restart the cause of pan-Maghreb unity. Finally it’s important to note that beyond calling for the separation of powers, the preamble does not provide for the system of government (parliamentary, presidential, mixed) or outline a “bill of rights”. These hugely important questions will be the subject of future debates at the Constituent Assembly. Tunisia Live has translated an English version of the preamble into English, it can be accessed here. For more on the constitution see also Alice Fordham’s article in the National and Thierry Bresillon’s excellent article in French at Rue 89, and Nadia from Tunis on her blog. Previous Constitution watch can be found here and here. 1) We the People of the United States, in Order to form a more perfect Union, establish Justice, insure domestic Tranquility, provide for the common defence, promote the general Welfare, and secure the Blessings of Liberty to ourselves and our Posterity, do ordain and establish this Constitution for the United States of America. In what hopefully (depending on government progress and my discipline) will be a regular feature on the blog over the coming months, I give you my first “constitution watch” – updating readers on progress in the Constituent Assembly in drafting Tunisia’s new constitution. Two articles this week discussed contents of the preambule of the new constitution, which were leaked, separately, to reporters. An article appearing in the Tunisian magazine Leaders reports that the new constitution will explicitly define the Tunisian republic as a civil state. According to their sources in the assembly it will also maintain the first article of the constitution and define the regime as republican, abolish the death penalty, and confirm respect for universal values. In a separate article published by Tunisia Live on Wednesday, the English-language site reports that the constitution will emphasize “applying Islamic principles to the constitution, explicitly defining the Arab-Muslim identity of the state.” The article is unclear on whether these are separate articles in the preambule or not. “The draft also describes the new regime as “republican, democratic, and participatory,” based on respect for the people’s sovereignty and the separation of state powers.” The report also states that the draft will be released to the public next Monday, June 4. There are no major revelations here, although it will be interesting to see how “applying Islamic principles to the constitution” will actually read in the final draft. Many secular opponents of the government have feared that while Ennahdha has specifically rejected references to sharia in the constitution, they will try to introduce a form of religion-based value tests for the country’s lawmakers and judiciary. For a further discussion on how the constitution is actually being put together, see this article by Duncan Pickard in the Carnegie Endowment. See also my previous discussion of including Sharia in the preambule here. Despite the obvious parallels between the Egyptian and Tunisian revolutions, and the clear effect Tunisia’s successful ouster of Ben Ali inspired Egyptian activists, there has been surprisingly little cross-pollination of democratic ideas between Egypt and Tunisia. But as the Egyptian presidential race heats up and Tunisia enters another dangerous escalation between secularists and Islamists, there is the possibility that Tunisia’s Islamists, long a bastion of moderation among Muslim Brotherhood-inspired parties, will adopt Egypt’s more conservative approach. This could have two contradictory effects in Tunisia, both of which could drive further fissures through Tunisia’s increasingly divided political landscape. Despite the dominate narrative of the Arab Spring – as a collection of uprisings linked by common cause against authoritarianism in the Arab world – Tunisian public debate has been largely insulated from events elsewhere in the Arab world. While Tunisians are aware of and sympathetic toward the other uprisings – especially in Libya and Egypt – there has been little public discussion of the paths toward democracy these countries have taken. Tunisians rightly see their path as a model to follow – rather than the violent and chaotic paths followed by their neighbors. Tunisia’s separate path has also been due to the much more moderate inclinations of its leaders. After well-run and fair elections, Tunisia’s Islamist party immediately joined hands with secularist counterparts to run the government and write the constitution. Unencumbered by ultra-conservative political parties in the government – such as Salafi parties – the coalition has taken many moderate stances, including the announcement last month that Ennahdha would not endorse inclusion of sharia law in the new constitution. Ennahdha’s moderation, however, has cost it support both among its more conservative members, many of whom are more influenced by traditional Muslim Brotherhood political ideas (from whence the movement began) and by an increasingly vocal Salafi movement, which while officially excluded from politics, is making itself and its views seen across the country. And despite its moderation on key positions, its inaction against rising extremism and its seeming complicity against very public threats to basic freedoms has made Tunisian secularists skeptical if not openly worried about the future path Ennahdha will take. One month before Egyptians begin voting for their first president after Hosni Mubarak, Mr. Morsi’s record is escalating a campaign battle here over the place of Islam in the new democracies promised by the Arab Spring revolts. The Brotherhood, the 84-year-old religious revival group known here for its preaching and charity as well as for its moderate Islamist politics, took a much softer approach in the official platform it released last year. It dropped the “Islam is the solution” slogan, omitted controversial proposals about a religious council or a Muslim president and promised to respect the Camp David accords with Israel. Firstly, while Ennahdha is a well-oiled and disciplined political machine, its leadership is widely recognized as lying at the more liberal end of the party’s political spectrum. The debate over sharia was, by Ennahdha leader Rached Ghannouchi’s own confession, widely contested within the party before being decided upon. Ghannouchi’s argument was not a defense of civil institutions, but rather a wish to avoid a controversial debate at a critical time for the country. If Egypt tilts further to the right, Tunisia’s more conservative Islamists – many trained side-by-side with their Brothers in Egypt – could begin to press for more conservative stances within Ennahdha – testing Ghannouchi’s leadership. 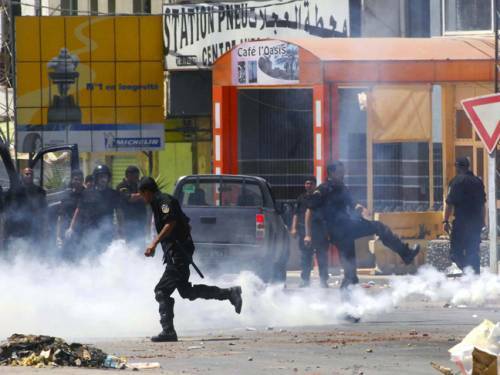 Tunisia’s Salafi groups may be further emboldened at pressing for more radical change. At the same time, Ennahdha’s secular partners in the government (CPR and Ettaktol), already under pressure from opposition groups to join them, would be forced to choose between abandoning their partner in government, or going along with a platform much more conservative than they had agreed upon. Secondly, Tunisia’s secularists (in this case I use the term to describe both secularists in the liberal sense, as well as those from the Bourguiba mold), already anxious about a country run by Islamists, may take bolder actions against the government. Already Tunisian secularists are sounding the alarm bells. At a meeting yesterday, secularists from various parties gathered to voice their extreme concern over events over the weekend which saw Salafi activists disrupt a planned event of a well-known secularist activist and a physical attack on a political figure. The events, troubling in and of themselves, caused even greater alarm by the perceived luke-warm response of the Ennahdha ministers at the justice and interior ministries. The meeting yesterday included calls for the opposition to boycott the Constituent Assembly and to change their tactics from those of opposition movements to “resistance” movements. Tunisia’s secularist will look with anxiety to an Egypt which has turned further to the right. Coupled with Ennahdha’s moderate rhetoric, secularist alarmism has mostly fallen on deaf ears in Tunisia. Most Tunisians simply do not see their country following the path of Iran or Saudi Arabia, and the Algerian civil war – with its complex moral narrative – is already a decade in the past. An Egypt which has turned toward the extreme would provide secularists with a narrative that could be a call to action among secular sympathizers in the country. Both of these effects would be dangerous for Tunisia. Already polarized, Tunisia’s fragile political system would break down if the CPR and Ettaktol abandoned the government. Neither Ennahdha nor the secularists have enough seats to form a majority government. But even barring this extreme example, political parties will find it increasingly difficult to compromise in an even more polarized political environment. With elections scheduled within a year, the government may find it difficult to write the constitution on time – creating further pressure in the system as the country would face a constitutional crisis and the government (in whatever form it took) would face criticism that it could not act.